You have no idea how excited I am to share this recipe, because it passed my, very often, skeptical work colleagues taste test, with flying colours! And when it comes to raw chocolatey things, that isn’t the easiest thing to do! So you better believe this pie is good. I’m super lucky to work at a vegan food magazine, and we often get sent raw chocolates to taste, which is like Christmas come early every time for me. But for the most of the other guys at work, not so much! I think raw chocolate is one of those things that when you first start eating it, you’re like ‘wait, no, this stuff is too damn rich! I can’t cope!’ But once you fall in love with it, that’s it; you’ve gone to the dark side for good. And there’s no going back. The majority of my workmates aren’t yet converts, and often find it a bit too dark and bitter, and they’re not afraid to say just how weird (read: gross!) they think it is, but yet they often ask me to bring in the food I share on my blog for them to try. I’ve been holding out for about 8 months now because I thought that whilst my desserts might look like the real deal, as with all raw desserts, the tastes and textures are super rich and intense compared to normal desserts, and the lack of cream and white sugar just doesn’t tickle some peoples taste buds when they’ve been used to traditional puds! I was a little bit nervous of bringing in anything in case it’s just too, well, raw for them (and I really wanted their first raw dessert experience to be worth the wait! ), but this pie could win over any skeptic, and in fact the chaps in the office thought it didn’t taste raw at all, which is high praise from non raw-foodies! A couple even asked for the recipe, which is pretty fun, because discovering raw treats through This Rawsome Vegan Life is the way I found myself opening up to the whole idea of a plant-based diet, and I hope one dessert at a time to help people realise what an abundant lifestyle this is! There’s no question about it, this dessert has become an instant favourite! The base tastes reminiscent of an Oreo (even my friend at work said it tasted like Oreos, and it was her first time sampling the wonders of raw puds), thanks to the fragrant carob, which adds the gorgeous, signature black colour too. You could substitute cacao power in place if you want to cut down on the ingredients list, but I’d recommend having carob around the house because it is wonderful for improving digestion, lowering cholesterol and is high in anti-oxidants. But let’s discuss that cookie cream filling, because is to die for. SO CREAMY. Oh gosh, it was hard to take photos of this thing with that melt-in-your-mouth texture, but totally worth it. Coconut butter is the secret ingredient here (I use Coconut Merchant’s organic, cold-press coconut butter), because it has a lower melting point than coconut oil, so it makes this more pie-like than cheesecake like. If you prefer a firmer texture, and less squishiness, just sub the coconut butter for the rest of the coconut oil. I’ve been using a Vitamix S30 for a few months now, and I really think finally having a high-speed blender has taken my creations to the next level in terms of the texture it can achieve compared to my old blender. I won’t tell you it’s the perfect blender, because it has quite a small jar which forms air-pockets above the blades quite easily, which means you have to give the mixture a good stir every minute or so until the mixture starts to become more liquid. But oh boy, once the blending is done, you are left with the creamiest, dreamiest textured desserts ever. I mean, just look at the squish on this pie! You’d never guess this layer started it’s life as crunchy old cashews! And we can’t forget the ganache, which is made with just three simple ingredients, and runs rings around traditional ganache as it’s nearly impossible to ‘split’, and achieves a mirror shine with very little effort indeed, as long as you make sure the coconut oil stays cool when you melt it over a bain-marie. Plus it’s so thick, fudgy and downright chocolatey that you’ll wonder whether you secretly added a can of coconut cream to the mix! I hope you give this pie a try because I think it’s a bit of a winner! And if any of you are heading down to VegFest in Bristol this weekend, I’m working in the Amphitheatre at stall A48 (I think!) 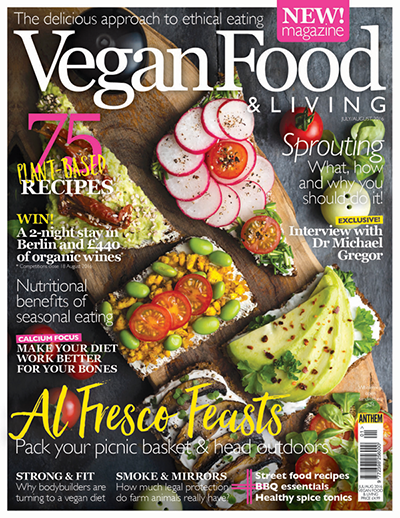 on Saturday celebrating vegan awesomeness with our new magazine, Vegan Food & Living magazine. I’ll also be wandering around stuffing my face with all the food on Sunday, so come say hey if you see me! A raweo biscuit base, topped with a silky smooth chocolate chip cookie dough vanilla cream and rich chocolate ganache. My flan pan was 36 x 12 cm. Grease a rectangular flan pan with coconut oil. Pulse the nuts into tiny pieces. You don't want it too chunky, but don't pulse it into flour. Add the pitted Medjool dates and pulse to combine with the nuts until everything sticks together. Add the carob powder and pulse until you have a sticky, dough like substance. Press the mixture firmly into the pan, making sure you press the mixture into all the gaps around the edges. Place the pan in the fridge whilst you make the cookie dough cream filling. Place the cashews, maple syrup, water and vanilla into a high speed blender (I use a Vitamix S30) and blend until combined in a thick paste. Add the coconut oil and butter and blend until smooth and creamy. You may need a couple of extra spoons of water to help the mixture along, but don't add too much or you will need to add more coconut oil. Pulse the cacao nibs in a blender until they are roughly chopped into small pieces. Add them to the cookie dough cream and stir in with a spoon. Pour the mixture over the base and place in the freezer to harden whilst you make the ganache. Pour the ganache evenly over the top of the cookie dough filling and place back in the fridge to harden completely for 3-4 hours before serving. Hi Hannah! Thank you so much, you’re so sweet! I just can’t recommend carob enough! It’s a very different taste to cacao, sort of spicy and aromatic, but it is just gorgeous in energy bites and brownie bars! Tried it, loved it, gonna blog it!! 🙂 Thank you so much for the recipe!! Just such wonderful food as an alkaliner someone who does the alkaline diet and an vegetarian , I eat lots of oats, wheats , lentils , brown rice , quiona , buckwheat , barley , seeds, nuts , avocado , peanut butter , sweet potatoes , chick peas,trek bars and cliff bars and cliff protein bars and drink green smoothies from my nutri bullet , I eventually want to do an part time raw diet I think 100% is too distrastic and I do lots of running , squats , press ups, sit ups, weight training I think I need more than just 5 percent plant protein recommended on raw till 4 etc and 80/10/10. I don’t understand as lentils and chickpeas are very nutritious etc . I have made vegan cakes before with bullingtons unrefined sugar, doves farm gluten free flour and raw Caco and maple syrup or agave nectar etc I want to make more raw food I love this I love healthy food could eat this in an second . Are you 100 percent raw and is it Raw till 4 or 80/10/10 do you eat a lot of plant protein . Also I live in north london Tottenham there is an vegan cafe but no vegetarian or vegan places how do you find being raw in Bristol I would find it hard where I live at the moment knowing what to buy and what is raw . I have researched raw diets . expensive the alkaline lifestyle book series one for breakfast alkaline receipts, lunch alkaline recipes and dinner alkaline recipes this is very easy I feel amazing full of energy I eat no refined sugar only sugar in fruit, vegetables and rice, etc. I only occasionally eat organic milk chocolate or vegan chocolate or sometimes no gelatine organic sweets. When did you go raw vegan where you vegetarian or eating meat before hand do you eat nuts, seeds, avocado plant fats or is it exclusively 100 percent high carb low fat raw till 4 80/10/10 etc . I have tried it and it is fantastic! You will have enough for 03 days (if you are a couple) and it helped very much to kill my desire for sweets. Raw is the real life 🙂 Thank you for sharing!